The Iraqi Interior Minister, Bayan Jabr, has played down the scale of abuse in a detention centre run by his ministry. At a news conference in Baghdad, Mr Jabr disputed reports that 170 detainees were mistreated at the compound and said there had been only a few cases. Flanked by his top security officers from the ministry, Mr Jabr was very defensive. He accused the media and his critics of blowing things out of proportion. But the most remarkable thing about the event was how reminiscent it was of news conferences in one party-states, or, in this case, from the era of Saddam Hussein. Mr Jabr began the conference by listing the great advances in security he said the ministry had achieved under his stewardship. His senior officers sitting next to him praised him. One by one they all said the minister had always emphasised the importance of respecting human rights. A strange assertion in view of what has just been found in the ministry's detention centre. Mr Jabr looked like a beleaguered man, making up his defence as he went along. 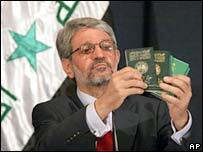 Waving a bunch of foreign passports, Mr Jabr said some of the detainees were Arab terrorists who had killed many Iraqis. 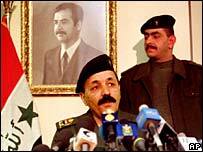 Then he blamed the abuse on officers who had once served in Saddam Hussein's army and promised to get rid of them. Both the detention centre and Mr Jabr's defence at the news conference illustrate very clearly the difficulties involved in transforming Iraq from a one-party state to a country run by a transparent and accountable government.